Canadia’s Bank’s futuristic $100 million Riviera project on Koh Pich Island will begin construction early in 2013, according to a company spokesman. Riviera project manager Chen Hok said that two 28-storey buildings and three buildings of 38 storeys will be built in early 2013, while they are working with their partners to aid the construction. The project consists of apartments, a supermarket, condos, offices, an amusement park and a two-hundred metre-pool running across the tops of the 38 storey-buildings. “The expenditure on this project is not determined because the price of building equipment and materials are unsteady so we don’t know precise figures yet,” he told Post Property. Ban Souly, the sales manager of Riviera, said many potential customers are interested in Riviera; its 104 flats will be purchased immediately after the company announces it is to sell some parts of the five buildings. “Many clients are interested in condos after it was announced that the average price is $1,800 per square metre,” she added. Sung Bonna, Director of Bonna Realty Group and president of the Cambodian Valuers and Estate Agents Association said this project is an opportunity to succeed in making Koh Pich became a busy economic center so it will be popular after completing construction. “The success of this project is due to good location and circumstance,” he added. Dith Channa, general manager of VMC Real Estate Cambodia, agreed with Bonna, saying it is in a good location and is different to other buildings in Cambodia because it has the huge pool on top and also offers entertainment, so it has the potential to attract local and international clients. “The project is in a good location and environment that is surrounded by water and fresh air, as Chinese Feng Shui is a priority. On the other hand, it also updates the beauty of Phnom Penh and real estate as well as attract tourists,” he said. Japanese Investment in Cambodia is steadily increasing as a result of sharply rising wages in China and other Southeast Asian nations. But experts warned this week that for sustained investment growth and to avoid driving Japanese companies to other attractive investment destinations such as Burma the government must address the country’s skilled labor shortage and reduce electricity costs. Japanese investment in Cambodia reached $75 million last year, up from about $35 million in 2010 and about $15 million in 2009, according to the Japanese Embassy. This year, however, investment by Japanese companies will reach $300 million thanks to the $205 million Aeon Mall development in Phnom Penh, construction on which begins this month. “The biggest advantage of Cambodia is the low cost of labor, Japanese companies made very big investments in China, Vietnam and Thailand, [where] labor costs are increasing rapidly,” said Hiroshi Suzuki, CEO and chief economist at the Business Research Institute for Cambodia. Restrictions on foreign-owned business, especially in China and Vietnam, also contrast with Cambodia’s “free economic system” and minimal taxes, Mr. Suzuki said, adding that in Vietnam, companies must be 50 percent owned by Vietnamese nationals and have a board of directors that is also half-Vietnamese. Local company VLK Royal Tourism Group has embarked on a joint venture with a Thai partner to build OC Hotel, a four-star boutique hotel in Sihanoukville. The venture was prompted by rising demand as well as increasing tourist numbers to the coastal area off the back of its listing on the Paris-based Most Beautiful Bays Club last year. Chairman of VLK Lav Heng declined to disclose capital investment details or the name of the Thai partners, but did say during the hotel’s soft opening that the company undertook many years of market research on the potential for hotels of this kind in the area in addition to overseas market research to gauge demand among prospective travelers. “We have not finished our development as the market demand is still huge. Our investment will be in proportion to market demand. If it becomes bigger, we will spend more. We’re trying to provide a four- or five-star service,” he said. According to Lav Heng, the hotel was built in the hopes of elevating Cambodia’s accommodation options to be comparable to those of neighbouring countries like Thailand and Vietnam, and so and joint venture was ideal for this. Amornarat Kongsaway, representative for the Thai partner in the joint venture, said her investment was certainly to cater to the increasing demand for boutique hotels. “We travel overseas a lot and we know the trends and what customers are looking for is something different,” she said. “That’s why we set up this boutique hotel. Customers want hotels that are unique, small and personalized. That’s our market focus,” she added. According to Amornarat, social media will be the key to convincing prospective customers of the high standard of hotels in Cambodia. “We have a lot of experience in this area … this is a good chance for Cambodia to show overseas tourists that Cambodia also has good standard hotels that can accommodate them,” said Amornarat. Ho Vandy, president of World Express Tour and the co-chair of the private sector working group, applauded any investment into new hotels in coastal areas, particularly boutique hotels. He said Sihanoukville has about 50 hotels with more than 2,000 rooms which are modern but not boutique with some being quite dated in their design. Guesthouses add another 2,000 rooms to the province’s total. “Despite having around 5,000 rooms, it does not cater to the increasing demand during public holidays or the high tourism season. Currently, the province can only cater to demand during normal periods, not special occasions, we are always facing this problem,” he said. The Ministry of Tourism’s figures show the number of international tourists in the Kingdom saw an increase of 23.6 per cent during the first nine months of the year. During this period, coastal areas saw an increase of 50.3 per cent, or 206,129 visitors. For many years, Phnom Penh’s villas have represented the most attractive and obvious options for both commercial and residential use in the city, but experts say the number of villas available is on the decline. The stock of villas is decreasing, due to the demolition and redevelopment of plots to make way for new real estate projects that offer higher yields. While romantics may mourn the changing face and skyline of the city, property professionals say it represents a move towards modernity that is good for the long-term future of the city. The report says that a large amount of villas have been sold off to developers, and landlords who have kept their villas are increasingly turning towards commercial tenants. While organizations like Microsoft, Coca-Cola, Unilever, the UN, the World Bank and a number of embassies still occupy villas, the report says that they are likely to move into the high-quality purpose-built office buildings that are springing up around the city, prompting further development of the land they currently occupy. The report says the new supply of villas in the market is dominated by developments on the outskirts of the city, and that these projects are locally developed and driven by owner-occupiers. However CBRE’s report says that villas will remain desirable. “Even with more economically viable rental options available in the market, demand for villas will remain strong. Some large international organizations have set requirements of being located in standalone properties due to security.” This will mean that, due to the high demand and the decrease in the existing supply, villa rents are likely to continue to increase in central Phnom Penh. Maruhan Japan Bank yesterday became the first commercial bank in Cambodia to make a direct equity investment into a microfinance institution by becoming Sathapana’s majority shareholder, with a 95.1 per cent stake. Financial details were not disclosed. The shareholders who sold out to Maruhan were FMO, the international development bank of the Netherlands; Developing World Markets, a US-based asset manager specialising in microfinance investment; Tridos, the Netherlands-based global impact investor, Sathapana Employee Investment Limited and founding share holder; Cambodia Community Building NGO, according to a press release. The primary rationale behind the exit of these stakeholders was due to Sathapana achieving its objective of increasing access to finance for poor and rural communities, reaching a level of maturity that would make it attractive to a private sector financial institution to step in as a majority shareholder. At this early stage of the acquisition, Maruhan’s general manager, Shizuo Onishi, said, the move is in line with the bank’s goal of developing Cambodia, and right now its position as the majority shareholder is philanthropic. However, the long-term goals for the acquisition do have monetary gains in mind. Construction investment rises sharply Investment in construction in the Kingdom during the first nine months of this year rose 83.6 per cent, according to data from Ministry of Land Management Urban Planning and Construction last week. The data showed that during the first nine months of this year the ministry approved 1,357 construction projects involving 5,593,284 square metres of total construction area and worth US$1.8 billion. The same period a year earlier saw 1,689 approved projects over 3,228,799 square metres of total construction area and worth $999 million. Lao Tepseiha, deputy director of the construction department of the Ministry of Land management Urban Planning and Construction, said it is the biggest-ever increase, and involves projects as diverse as satellite city development projects, apartment buildings, villas, houses, shopping centres, business centres, offices, educational institutions, and hospitals as well as banks, hotels, factories, warehouses, and petrol stations. “The growth is a good sign for the construction sector in Cambodia, when foreign investors are very interested to invest in construction. It’s good for now and the future,” he said. “I think that given economic growth, political stability, and good cooperation with our foreign partners, investment will grow higher than last year because there are lots of new applications requested to the ministry, higher than the applications in September,” he added. He said increasing domestic investment due to confidence in the political stability in Cambodia is increasing. “There are many people investing in residential construction projects: some people use housing loans to buy house and some use their own cash. These factors make investors feel more confident in their projects, especially projects in Phnom Penh,” he said. On 24th Sept. 2012, H.E governor KEP Chuk Tema allowed Mr. Yajima, President of Aeon Mall to participate in a discussion at Phnom Penh Capital Hall. 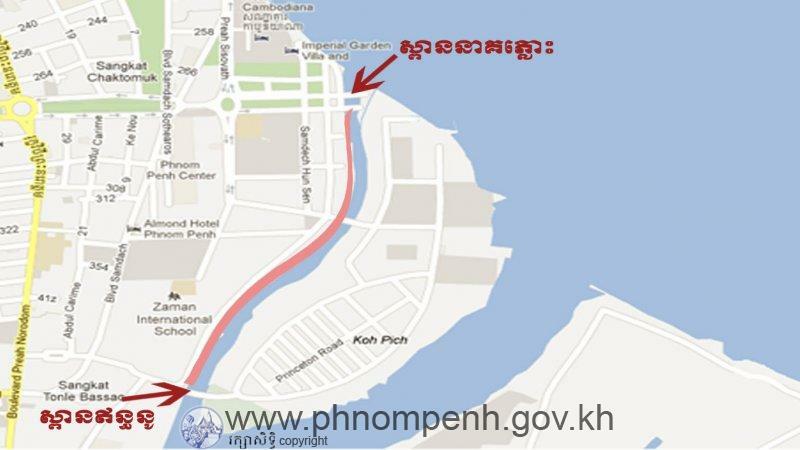 In the meeting, the Aeon Mall company president expressed his intention to build an asphalt road, 913m long, along the west river bank of Diamond Island, located in Tonle Bassac commune, Chamkarmon district. The construction will be undertaken in joint cooperation between Phnom Penh Capital Hall and Aeon with the contribution being an even 50% split between the parties. The road is located between the swan bridge and the rainbow bridge. The construction also includes sewage installation and floor sidewalk improvements. The road improvement project is estimated to cost around 2,123 Million Riel (approximately US$530,000). Aeon Mall Company is a major mall investment and development company from Japan with more than 100 branches across Japan and many more countries across Asia. The company will start construction at the end of 2012, spending 16 months and around 200 Million US Dollars. Cambodia Airports estimates the number of passengers entering via Cambodia’s two international airports will increase by an average 8.8 per cent in 2013. That prediction is 1.2 per cent lower than the 2012 projection of a 10 per cent increase. The lower forecast is due to the uncertainty of the global situation, especially the US and European countries, as well as the slowdown of the economy in China. Cambodia Airports chief executive Emmanuel Menanteau expects the number of passengers will increase by seven per cent for Phnom Penh’s airport, to around 2.25 and 2.55 million arrivals for Siem Reap, a rise of 10.5 per cent, he said during a press conference launching Cambodia Airports’ new winter schedule. “Cambodia is expected to maintain its economic and tourism growth momentum, key drivers to the rise of air traffic. The trend should be carried out all along the year 2013,” Menanteau said. “However, the uncertainty of the global economy may impact on the overall demand of air transport, with spill-over effects on traffic in Cambodia,” he said. Ho Vanndy, co-chair of the Tourism Private Sector Working Group, agreed that passenger numbers from the US and Europe are low, but said they are still potential customers for Cambodia’s tourism sector. “We noticed that some airlines from Europe that used to operate charter flights suspended their operations between 2011 and 2012. We’re not sure whether or not the projections are accurate,” he said. “However, if their economy is improving, we’ll have more tourists from them due to Condor Air beginning a direct flight from Frankfurt to Siem Reap once a week,” he said. Menanteau said that a local carrier, Cambodia Angkor Air, will operate new flights between Siem Reap and Bangkok, with seven flights a week, and weekly flights from both Phnom Penh and Sihanoukville via Siem Reap. Tourist arrivals by air rose 16 per cent over the first eight months of the year to 1.11 million tourists, of which those via Phnom Penh rose nine per cent. Figures for Siem Reap increased 22 per cent, according to the data from the Ministry of Tourism. It shows visitor numbers from ASEAN countries rose 38.6 per cent and account for 42 per cent of arrivals. Those from Europe increased 11.7 per cent for a 17 per cent share, while figures for the US rose 12.7 per cent, contributing 4.9 per cent of arrivals, and China’s went up 31 per cent. The Ministry of Tourism expects Cambodia to receive three million tourists this year, about five million by 2015 and seven million by 2020. Hun Sen announces new airport Prime Minister Hun Sen requisitioned 768 hectares of land on Saturday that will be used to build an international airport in Kampong Chhnang after 2025. During presiding over a land title distribution ceremony in Kampong Chhnang province, the prime minister announced the expansion of the airport. “I have previously informed you about the vision of a new international airport that will be implemented, but I did not identify Kampong Chhnang,” he said. Ten days ago, Hun Sen said at the launch of the 2012-2020 Tourism Development Strategic Plan at Vimean Santepheap that the current airports cannot serve the increasing numbers of passengers expected to arrive in Cambodia. But he did not indicate in this speech plans for a new airport. “We cannot use Pochentong Airport after 2030. By 2025 or 2030, we expect to use the airport here, 90 kilometres from Phnom Penh,” he said. There are 1,463 hectares at Kompong Chhnang airport, with citizens controlling 768 hectares of that land. In comparison, Phnom Penh International Airport occupies 450 hectares of land. Ministry of Tourism officials forecast that foreign visitors will increase to four or five million by 2015 and this will climb to seven million in 2020. “So Kampong Chhnang airport will become the site for the international airport,” Hun Sen said. The apartments range from 60 sqm to 110 sqm with private balcony, the lease available from 6 months. Cambodia’s government has approved a controversial hydroelectric dam on a tributary of the Mekong River. Environmental campaigners say the dam will damage the river’s biodiversity and devastate the livelihoods and homes of thousands of people. “We are surprised by the approval,” he told AFP news agency. Damming the Mekong River has caused widespread controversy in South East Asia. In 1995, Cambodia, Laos, Thailand and Vietnam set up the Mekong River Commission to help manage and co-ordinate use of the river’s resources. In Vietnam, many owners of condominiums in building complexes in Hanoi have been involved in lengthy disputes with the management over disagreements involving service charges. The Ministry of Construction in Vietnam has now had to issue a guide code, setting maximum levels for the service charges. In the case of condominium service charges, after calculating correctly, the fees were higher than the service charges put forth by the Hanoi People’s Committee. The final amount must be agreed upon by more than 50 per cent of apartment residents and more than 50 per cent of board members. The main issue currently arising in Phnom Penh is the implementation of a committee for the true co-owners within developments. One of the main issues is the developer retaining control of the property’s management. Often a company linked to the developer is appointed to manage the property, thus making a profit from the co-owners, even though the true owners of the building have not agreed on the appointment. Cambodia does have laws in place that state that co-owned buildings should have a committee set up to address such issues involving management. However, the law doesn’t state when a committee should be set up, leaving co-owners with a certain lack of control. In the West it is common practice for co-owned buildings to have committees making key decisions on management issues. The service charges often reflect day-to-day running costs, but also a sinking fund for future maintenance requirements, easing the burden on co-owners when expensive defects arise in common areas. In Phnom Penh, due to the infancy of the condominium market, sinking funds are not being set up. In the future this could become a problem for co-owners. Low service charges may seem attractive initially, but if an inexperienced management company is in place, budgeting will be inaccurate, leaving the investor out of pocket in the long run. Meanwhile, the prices of apartments in Hanoi continued to decline in the third quarter of this year, reflecting the prolonged stagnation in the city’s real estate market. CB Richard Ellis Vietnam’s third-quarter report on the Hanoi property market showed similar trends. “Secondary asking prices continued to drop by 5 percent quarter- on-quarter to an average of about $1,730 per square metre, following a downward trend that started in the last quarter of 2011,” said CBRE executive director Richard Leech. Developers have been revising business strategies in terms of target customers and the types of products offered, putting greater efforts into sales and customer service and showing a willingness to compromise on prices and payment structures, he said. Phnom Penh condominium prices remain stable and sales figures for new developments have been good. The city is starting to see an influx of supply, with a number of new condominium developments entering the market. Investment is still largely driven by speculation into up-and-coming areas. Phnom Penh is currently lacking a high-quality completed condominium development in BKK that would attract investors with a good rental return. PHNOM PENH, Oct. 24 (Xinhua) — Three international airlines are scheduled to launch their direct flights to Cambodia in the near future, according to a report of Cambodia Airports, the developer and operator of the country’s international airports, released on Wednesday. The new airlines are Condor Air of Germany, Qatar Airways and Lao Central Airlines. Condor Air is slated to launch the flight between Frankfurt and Cambodia’s Siem Reap province from November 3, 2012 with its B767- 300 plane, which can be seated by 270 passengers. Qatar Airways is expected to start the flight between Doha and Cambodia’s Phnom Penh from February next year with its A330-300 plane, which can be seated by 305 passengers, the report said. Lao Central Airlines is also due to operate daily flights between Vientiane and Phnom Penh with a B737-400 aircraft, which can be seated by 168 passengers. The report said that the Qatar Airways and Lao Central Airlines subject to approval from Cambodia’s State Secretariat of Civil Aviation. According to the report, currently, 25 airlines have been operating at the country’s two international airports on a scheduled basis. The kingdom’s two international airports recorded a total of 1. 26 million international arrivals in the first eight months of this year, up 18 percent from 1.07 million arrivals at the same period last year. The private company HOdo Group Co Ltd, a textile and garment company in Wuxi, Jiangsu province, is looking to expand its presence in Sihanoukville, a province in southern Cambodia, in an attempt to diversify its business. Zhou Haijiang, president of the company, said it has made hefty investments since 2007 to establish the Sihanoukville Special Economic Zone in the Prey Nob district. The project now occupies three square kilometers and is expected to be eventually expanded to 11 sq km. The total investment in the zone is to reach $320 million, Zhou said. “After its completion, the zone could help create 150,000 jobs for the southeastern Asian country in the next few years,” he said. Zhou, 46, is one of 24 private entrepreneurs who have been elected to be delegates to the 18th National Congress of the Communist Party of China, which is scheduled to start on Nov 8. HOdo, which sells clothing under its HOdo brand, had 35.1 billion yuan ($5.6 billion) in revenue in 2011, an amount that has continued to show double-digit percentage increases since 2008. The economic zone is a fully functional business park, which has already attracted 23 companies. Among them are eight foreign companies, including the Ireland-based Horseware Products (Cambodia) Co Ltd, US-based Galey Global (Cambodia) Co Ltd and French Cambodian Gateway Underwear Co Ltd, Zhou said. More than 95 percent of the employees at the zone are local residents. “HOdo’s attempt was made to echo the nation’s call to ‘go global’, and the park is one of nine economic zones that have been initiated by Chinese companies abroad,” Zhou said. The construction of the zone has been aided by low costs, favorable trade conditions and the vast market of the Association of Southeast Asian Nations. Insiders said veteran workers there earn about $100 a month and companies employing about 1,000 people will pay about 27 million yuan less to operate in the zone than they would at the average factory in China. Cambodia also has no quotas limiting the amount of cotton that can be imported into the country, which helps companies there reduce their costs for raw materials.